Veterinarians - we invite you to join our winning team . . . Core Balance is proudly made in the U.S.A.
Let us show you how to incorporate Core Balance into your practice. Join the NEW GENERATION of Equine Performance Nutrition! 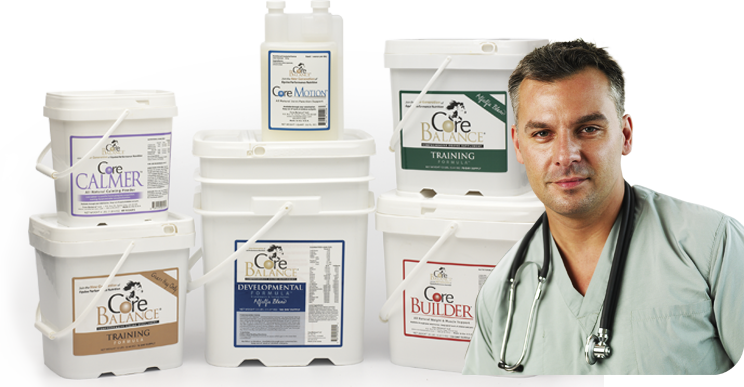 Only available through veterinarians and our website, Core Balance provides you with our complete line of fully balanced horse supplements at a profitable discount to make available at your clinic or through your practice. Manufactured in the United States, with no fillers, additives or binders, our five products are created using the highest quality ingredients (at sufficient levels) to maximize your horses’ benefits. We adhere to the latest research and guidelines as set by NRC (Nutritional Research Council) and KER (Kentucky Equine Research). What are the benefits TO YOUR PRACTICE? Core Balance is a consumable product. It generates a repeating revenue stream as it is fed daily. Additional horses will be added to the program over time as results are noticeable. Core Balance is purchased at regular intervals, thereby promoting a continuous contact between the veterinarian and the horse owner. This allows for other revenue streams when the client contact is made. Core Balance builds trust and a more developed relationship between the veterinarian and client, establishing the veterinarian as a go-to source for not just medical care, but direction on nutrition. to see what veterinarians are saying about us.